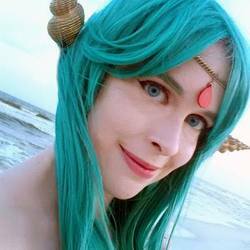 Rika is an artist and cosplayer based out of the Florida Panhandle and has been cosplaying since 2009. She has an intense love for every character she cosplays, and always tries to keep the "play" in cosplay, embodying the full character while in costume. To her, cosplay means first and foremost to "Be who you want to be". In early 2013, Rika moved to Florida and began becoming friends and working with some of the most talented cosplayers and photographers in the Southeastern US. With this new-found inspiration and support, her cosplay portfolio expanded dramatically, winning various local awards and making appearances at conventions along the Gulf Coast. Her favorite characters to cosplay have the duality of being sultry and seductive, yet extremely strong, powerful, and a little dangerous. When not cosplaying, Rika enjoys painting, table-top gaming, international foods, and all things Disney.